The Trump administration says it is amenable to a White House meeting between President Donald Trump and Russian President Vladimir Putin, raising the prospect of the Russian president's first Washington visit in more than a decade even as relations between the two powers have eroded. White House press secretary Sarah Huckabee Sanders said the White House was among "a number of potential venues'' discussed in Trump's telephone call last month with Putin. The Kremlin said earlier Monday that Trump invited Putin during the call. Both sides said they hadn't started preparations for such a visit. If it happens, Putin would be getting the honor of an Oval Office tete-a-tete for the first time since he met President George W. Bush at the White House in 2005. Alarms rang in diplomatic and foreign policy circles over the prospect that Trump might offer Putin that venue without confronting him about Russia's interference in the 2016 presidential election or allegations that Russia masterminded the March 4 nerve agent attack on a former Russian double agent. Russian President Vladimir Putin attends a meeting during his visit to Samara, Russia, March 7, 2018. Putin had more words of praise for U.S. President Donald Trump in a documentary released March 7. Much has happened since Trump and Putin spoke in the March 20 phone call. Trump said afterward he hoped to meet with Putin "in the not too distant future'' to discuss the nuclear arms race and other matters. But their call was followed by reports that Trump had been warned in briefing materials not to congratulate the Russian president on his re-election but did so anyway. Ushakov voiced hope that tensions resulting from the diplomatic expulsions wouldn't derail discussions about a summit. Trump has said maintaining a strong personal relationship with Putin is in the U.S. interest and has signaled to allies that he trusts his own instincts in dealing with the Russian president. 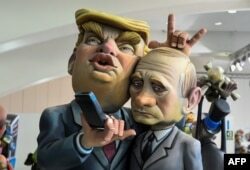 A Ninot, a doll depicting a celebrity that will be set alight during the Fallas festival, representing U.S. President Donald Trump and Russian President Vladimir Putin is displayed in Valencia on March 09, 2018. A White House official, speaking on condition of anonymity to describe private discussions, said Trump raised the possibility of a White House meeting in a "casual, open-ended'' fashion during the call. The official reiterated that no extensive preparations had taken place. Michael McFaul, who served as the U.S. ambassador to Russia under President Barack Obama, said the "symbolism of Putin standing in the East Room with the president at a news conference'' would be a major goal for the Russian leader. "The only reason you should do it is if you're going to obtain a concrete objective that serves America's national security interest before the meeting,'' he said. 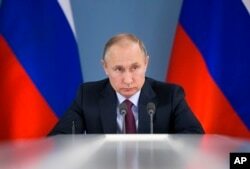 Trump had already fallen under sharp criticism from some Republican lawmakers for congratulating Putin on his re-election during the call and for not raising the ex-spy's poisoning. The fact that Trump also extended a White House invitation during that call was likely to increase concerns that Trump, when in direct contact with Putin, is inclined to offer olive branches and reluctant to raise difficult issues. 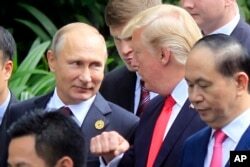 FILE - Russian President Vladimir Putin (L) and U.S. President Donald Trump talk as they arrive for the family photo session during the Asia-Pacific Economic Cooperation (APEC) Summit in Danang, Vietnam, Nov. 11, 2017. "I worry that Trump wittingly or unwittingly may be sending a more positive signal to Putin than he deserves,'' said Nicholas Burns, a top State Department official during the Bush administration who also served as U.S. ambassador to NATO. Russia's disclosure of the invitation came the day before the leaders of three Baltic countries - Latvia, Lithuania and Estonia - were to visit the White House. The three NATO nations are seen as a bulwark against Russia's aspirations of extended influence west of its border. Putin has been to other parts of the U.S. frequently in recent years, including a visit to the Bush family compound in Maine. Putin's meetings with Obama occurred at international summits and along the sidelines of the United Nations gathering in New York.